Bank of America Plaza is a skyscraper located in between Midtown Atlanta and Downtown Atlanta. At 312 m (1,024 ft) the tower is the 87th-tallest building in the world. It is the 11th tallest building in the U.S., the tallest building in Georgia and the tallest building in any U.S. state capital. 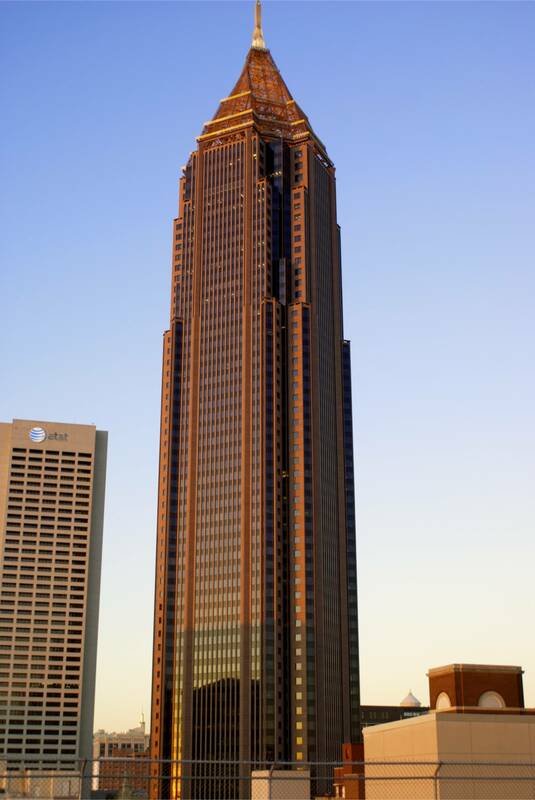 It has 55 stories of office space and was completed in 1992, when it was called NationsBank Plaza. Originally intended to be the headquarters for Citizens & Southern National Bank (which merged with Sovran Bank during construction), it became NationsBank's property following its formation in the 1991 hostile takeover of C&S/Sovran by NCNB. Turning Torso is a neo-futurist residential skyscraper in Sweden and the tallest building in Scandinavia. Located in Malmö on the Swedish side of the Öresund strait, it was built and is owned by HSB Sweden. It won the 2005 Gold Emporis Skyscraper Award. The project was designed by Spanish architect, structural engineer, sculptor and painter Santiago Calatrava and officially opened on 27 August 2005. The tower reaches a height of 190 metres (623 ft) with 54 storeys and 147 apartments. In August 2015, it was announced that the building was the winner of the 10 Year Award from the Council on Tall Buildings and Urban Habitat.